Mandatory spending is spending that is already baked in the budgetary cake. The spending for this programs is, as the description of this part of the budget suggests, is mandated by law. Congress would have to pass legislation to alter the expenditures for these programs. 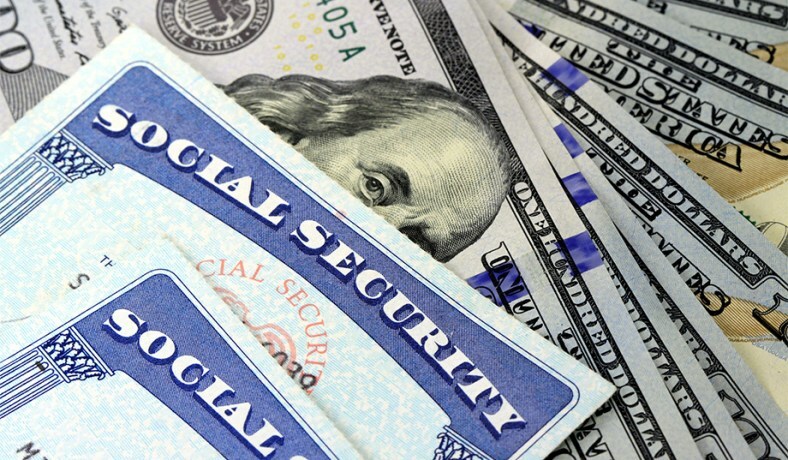 The largest mandatory programs are Social Security ($984 billion in 2018), Medicare ($707 billion), and Medicaid ($383 billion). But mandatory spending also includes ObamaCare subsidies, the Children's Health Insurance Program, the Supplemental Nutrition Assistance Program, federal pensions, and veterans programs. 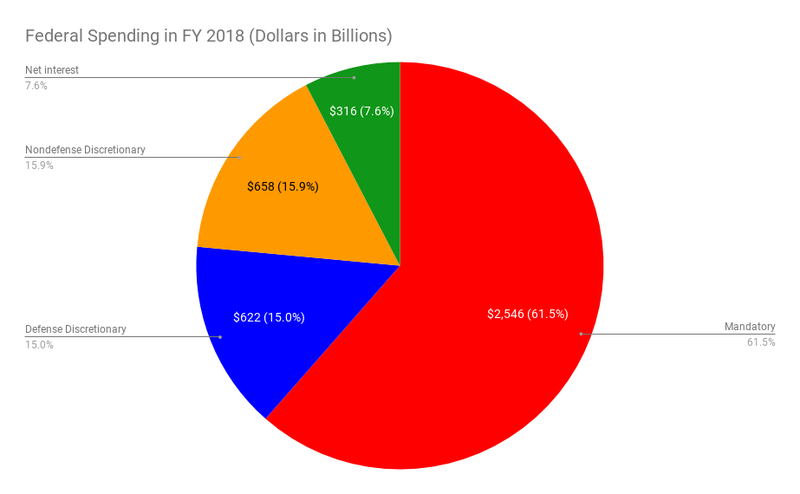 By 2028, we will see a continuation of a well-established trend in federal spending: the explosion of mandatory spending and interest on the national debt, having the effect of crowding out discretionary spending which is the only portion of the federal budget that Congress debates every year. Discretionary spending will increase 25.6 percent from current levels by 2028, but shrink from consuming 30.9 percent of the federal budget to consuming 22.8 percent of the federal budget. Mandatory spending will increase 77.7 percent from current levels by 2028, and grow from consuming 61.5 percent of the federal budget to consuming 64.2 percent of the federal budget. Interest on the national debt will increase a whopping 189.6 percent (nearly tripling) from current levels, and grow from consuming 7.6 percent of the federal budget to consuming 13 of the federal budget. It is clear that mandatory spending and interest on the national debt will quickly diminish the size of discretionary spending relative to the rest of the federal budget over the next ten years alone. This trend of mandatory spending growing at a rate significantly faster than discretionary spending has been occurring since the establishment of Medicare and Medicaid, and amplified by the growing population entitled to Social Security, which together make up the overwhelming bulk of the welfare state. For perspective, in 1968 only three years after Medicare and Medicaid were established, discretionary spending and mandatory spending consumed 66.3 percent and 27.3 percent of the federal budget, respectively. By 1998, the balance had dramatically shifted, with discretionary spending and mandatory spending consuming 33.4 percent and 52 percent of the federal budget, respectively. In 2018, the discretionary and mandatory percentages have almost entirely flipped from 1968 percentages, now at 30.9 percent and 61.5 percent, respectively. Politicians spend days, weeks, and even months debating over discretionary spending levels, year after year. While these levels are undoubtedly important monetarily, they are even more important for what they speak to about political will for further action on spending. As discretionary spending is increasingly crowded out by autopilot mandatory spending, it becomes decreasingly important whether or not Congress is able to put real limits on discretionary spending. It will not matter even if politicians decide to cut discretionary spending entirely -- without taking significant action to rein in mandatory spending, our country will still be on a fast trajectory to a fiscal crisis, insolvency, and ultimately default. Congress cannot even agree to limit discretionary spending which they have direct control over, as established clearly in this year's budget and appropriations legislation, the Bipartisan Budget Act and the Consolidated Appropriations Act. Such inability to be fiscally responsible with the easiest-to-address portion of the budget indicates both a spending addiction among our elected officials. More importantly, however, lack of restraint on discretionary spending displays a severe lack of the political will needed to tackle the much more deeply-entrenched and fast-growing mandatory wedge of the federal budget created by entitlement programs and welfare. Any serious proposal to cap federal spending and return our country to fiscal sanity must, beyond a shadow of a doubt, include mandatory spending in its scope in order to truly address the root of our spending problems. It remains to be seen how, if, and when this will be done. Sarah Anderson contributed to this blog post. iPhone 7 Plus Cases fortnitephonecase.com/iPhone-7-Plus-Cases I love the info on your internet site. Thank you so much. This is really a great website, i suggest you to post articles to attract visitors attention. Your website is really a great source of information. From that blog we have been added to our information about the different things about which we have to take great care with the change in the seasons.